Gero Onsen is located in the heart of Gifu Prefecture and is a town blessed with some of Japan’s most celebrated natural hot spring waters. With onsen scattered along every street this is the perfect place to unwind and rejuvenate while discovering the hidden surprises the town has to offer. While a nice onsen ryokan is most certainly the recommended place to spend a night in Gero Onsen, there are multifarious hot springs around town just waiting to be visited. The rather rustic-looking Yu-meguri Tegata onsen pass makes sure that visitors don’t waste the opportunity to experience Gero’s abundance of baths. The pass will set you back just 1,300 yen and allows you to hop into three onsens out of a choice of around 20. A popular pass for visitors, the Yu-meguri Tegata can be picked up from several spots including convenience stores, ryokan, and the tourist information centre where you can also get recommendations on which onsen would suit you best whether you’re looking for the best outdoor onsen, or the least-crowded. On a stroll around Gero Onsen town you’re sure to come across a whole plethora of small foot and hand springs that are free to enjoy. Uncomparable on a cold day, visitors can get toasty while waiting for the bus or after a long day walking by taking a dip in a roadside onsen. Even at nighttime several of the outdoor onsen are lit up and ready for passersby. With natural healing waters at every turn, it’s almost impossible not to soak up the relaxing vibes which make Gero Onsen so loveable. Just remember to carry a towel around to wipe off your feet afterwards. It’s not just the people taking a bath at Gero Onsen with onsen tamago, onsen-cooked eggs, a common feature on the menu. A local favourite is the onsen tamago ice cream especially from Yuamiya ice cream shop. Not for the squeamish, a semi-cooked egg is added to the ice cream with a dollop of miso and a whole spread of other toppings also available. After a good mix there’s no sign of raw egg and you’re left with a unique sweet and salty taste that is truly delicious. Onsen tamago puddings are also a popular dessert, while the daring are invited to scoop out an onsen tamago directly from the shell. As one of the nation’s top three favourite onsen resort towns, Gero Onsen has seen centuries of hot spring users travelling from far and wide to bathe in its waters. The Gero Onsen Museum, or Gero Museum of Hot Spring (sic), gives a fascinating insight into the history of onsen in Japan. Rumours about the healing qualities of hot spring water are cleared up in scientific explanations while they also delve into the culture of onsen going which remains an important part of Japanese culture today. Naturally, the museum houses some onsen that you can freely dip your feet in and as well as an interactive section where you can test out pH levels and make your own onsen themed Ukiyo-e woodblock prints. A ticket into the museum is 400 yen for adults and 200 yen for children with the museum open from 9am - 5pm every day except Thursdays. While it’s easy to believe that the natural hot spring water of Gero Onsen was always a feature of the town, there was in fact a time when it was feared that the water supply had been cut off forever. Originally the onsen town’s spring water was sourced from the foothills of Mt. Yugamine until one day in 1265 an earthquake hit and the water flow stopped. 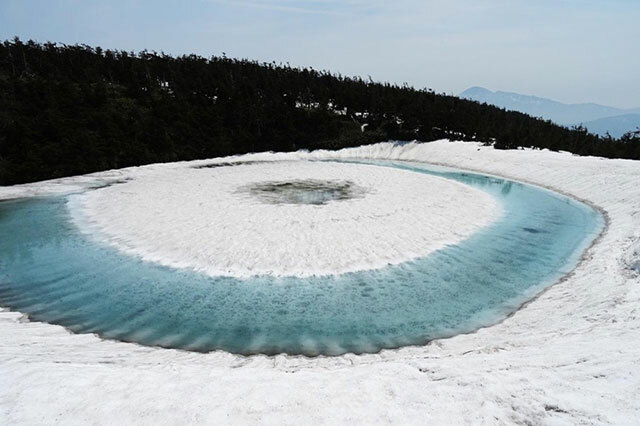 When the onsen water didn’t return locals were ready to give up the search until a white heron led them to the Mashita River a little west of the original source where the hot spring water continues to bubble out to this day. The Onsenji Temple was built a good 170 steps up a hill overlooking Gero Onsen town in dedication to the heron who rested in front of a Buddhist image believed to be a sign from the gods.